How much compensation can I claim for an accident at a fairground/funfair? When attending a theme park or a fairground, you expect to have fun. You expect to spend the whole day laughing and smiling. One thing you don’t expect to happen is to sustain an injury. Unfortunately, this can be the case, and there have been a number of fairground accidents 2017 – no doubt you are aware of some of the high profile ones. Fairgrounds aren’t always the safest of places. However, it is the responsibility of the fairground or funfair owner to ensure that they provide a safe and healthy place for the public. Anyone involved in the operation, maintenance, organisation, construction, and design of the fairground needs to follow strict health and safety procedures. If they have failed to do this, and you have been injured as a consequence, you will be able to make a claim. Read on to find out more information on doing so. What is a fairground accident? Have you been injured in a fairground accident? What should you do if you or your child has been injured at a fairground? Fatal accident and death due to a fairground accident can I claim? What can I claim for after a fairground accident injury? Injured while working at a fairground can I claim compensation? Can I claim for PTSD (post traumatic stress disorder) after a fairground accident? What can be claimed for after an accident causing injury at a fairground? 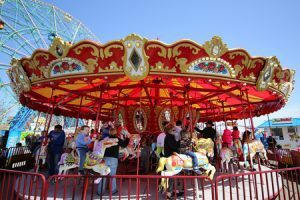 What kinds of evidence do you need to make a fairground injury claim? How much compensation will I get after an accident causing an injury at a fairground? Why choose us as your claims service for a fairground injury claim? Fairground accidents UK wide usually come down to one thing: negligence. While amusement parks are largely safe, accidents do happen, and they often happen because the necessary risks have not been properly attended to. From carriages coming loose to electrical failures, there are many reasons why fairground accidents happen. You may have also been injured while you were not on a ride; this could be due to poor food hygiene or an unidentified trip hazard, for example. No matter what has happened, and no matter where you were – be it a seaside funfair UK or a traveling funfair UK, you will be able to make a successful injury claim, so long as the accident was not your fault. This is something we can help you to do. We have an exceptional reputation for securing the maximum amount of compensation for our clients. But first, take a look at our guide below for more information on funfair accidents and fairground accidents in the UK. You will find information on how to make a claim for fairground accidents, average compensation payouts for the worst fairground accidents, as well as minor accidents, and much more. A fairground accident is any type of accident that has happened at a fairground, funfair, or amusement park, which was not your fault. Perhaps you have sustained bumper car injuries due to an electrical fault? Maybe you suffered food poisoning because you were served raw meat at the fairground’s café? No matter what type of accident has occurred, you simply need to prove that someone else is to blame for the hardship you have suffered. Most recent statistics show that fairground accidents are increasing. Over a 12-month period in 2014/2015, 489 members of the public reported injuries at amusement parks and funfairs. And, of course, there could be many more that were not reported. This figure is higher than the number of incidents that occurred in 2013/2014 and 2012/2013. The MP that called for these figures, Jim Shannon, has called fairground accidents a “more common occurrence” rather than an “occasional thing.” There have been many fairground accidents in recent times. Of course, there was the horrific Alton Towers incident, but this is not a standalone occurrence. Nine people were also killed in Lanarkshire at M&D’s, when a rollercoaster called the Tsunami crashed. When making any type of claim, proof is very important. Fortunately, most fairground accidents are caught on tape, as this video below shows. This video shows a common fairground ride. If you have been injured in a fairground accident, it is important to know that you are entitled to compensation for your suffering. As per the Health and Safety at Work Act, fair operators, managers, and owners have an obligation to maintain their machinery and ensure their fairground is safe for the public. If they have not adhered to the regulations that are in place, you will be able to secure compensation. All you need to do is give our experienced fairground accident solicitors a call, and they will be more than happy to take you through the claim process step-by-step. Parents can launch fairground accident claims on behalf of their children. If your child has been injured while at a fairground, you can make a claim for them. If you don’t do so, they will also have the option to make a claim themselves. They have three years from the date of their 18th birthday to do so. Of course, if your child is young, it is better to launch a claim now. The details will be fresh in your mind and it will be a lot easier to gather evidence. If you wait until your child becomes an adult, making a claim will be a lot more difficult, and your child may not realise they are entitled to compensation until it is too late. If someone you loved has been involved in a fairground accident, which has resulted in their death, you may be able to claim on their behalf. We have years of experience in fatal fairground accidents, and our experienced solicitors will be able to ensure you get the maximum compensation you and your family deserve. Are you entitled to make a claim on behalf of the deceased? You can make a claim if you are a family member of the deceased, or if you are a dependent of the deceased, i.e. the person that has passed away provided you for financially. In such cases, you will be able to claim for general damages, a bereavement award, funeral expenses, medical expenses, and punitive damages. Other expenses associated with death, which you can claim for, include loss of benefits, future loss of earnings, mental suffering and emotional pain, and effects that have a long-term impact upon family members of the deceased, including loss of on going protection and care, as well as loss of potential future inheritance, due to loss of savings and long-term earnings. If you have been injured in a fairground accident, you will be able to claim for a number of different things. Firstly, you will be able to claim for the injuries you have sustained, i.e. the pain and suffering you have experienced. Aside from this, you can also claim for any out of pocket expenses you have encountered as a direct consequence of the accident. These are known as special damages and include the likes of loss of income, counselling costs, treatment expenses, the cost of childcare, and much more. You simply need to be able to prove that the expense occurred because of the accident. Fairground accidents can have lasting effects on people. Not only is this in terms of physical injuries, but also in terms of psychological injuries. Some people really struggle to come to terms with what has happened, and extensive counselling is required. Everyone reacts to traffic events differently, and it is important to acknowledge that mental injuries are just as serious as physical ones. We make sure they are treated as such when launching a claim. While most fairground accidents occur to members of the public, you may have also sustained an injury while working at a fairground. Perhaps an object fell on top of you? Maybe you slipped on an unmarked wet floor? No matter what has happened, if the accident was not your fault, you will be able to launch a personal injury claim. You simply need to be able to prove that your employer is at fault for your suffering. There are many different ways your employer could be to blame. They may have failed to provide you with the correct training. Other possibilities include failing to carry out regular risk assessments, ignoring risk assessment findings, allowing you to use defected machines, and failing to inform you about potential hazards. A lot of people worry about making a claim against their employer, as they fear that they could lose their job as a consequence. This is something you do not need to worry about. If you have been injured, and your employer is responsible, they will recognise that you need to be compensated. After all, every employer is required to follow health and safety legislation by law. They are also required to have insurance in place, which will cover the cost of such incidents. If your employer were to fire you, they would only land themselves in bigger trouble, as you would then have grounds for unfair dismissal as well. Post-traumatic stress disorder, which is commonly referred to as PTSD, is an anxiety disorder, which can be caused by an event that has been distressing, frightening, or stressful. A fairground accident certainly falls into this category. If you are suffering from PTSD, you will be able to claim compensation. It is important to see a doctor so that you are diagnosed with this condition properly. Once a medical professional has diagnosed you, you can seek compensation for your suffering. Just because the injury is not physical, does not mean it isn’t as important! We will help to ensure you get the maximum amount of compensation you deserve for PTSD. If you have been involved in an accident at a fairground, it is important to try and gather as much evidence as possible. Of course, if the incident is a very serious one, you may not be in a position to do this. Your health should always be the main priority, so it goes without saying that this is what you need to focus on first. However, if you are able to, it would be beneficial to gather photographs and witness contact information. This can help to strengthen your claim for compensation. If you are ready to make a fairground compensation claim, the only thing you need to do is give us a call and we will handle everything for you. We will talk you through the claim process and everything that is involved so that you have a thorough understanding, and we will be with you every step of the way. When you call us, we will provide you with a free consultancy session. Not only does this give you the opportunity to ask any questions you may have, but it also enables us to ask you questions as part of our fact finding session. This is absolutely nothing to worry about. We simply need to ask you some questions so that we can thoroughly understand what happened. This will give us the ability to advise you in the best possible manner. We can also arrange a local medical for you if required. Chances are that you have already seen a doctor, but if you haven’t, or if further medical details are required, this is something we can sort out for you. This will come at no cost to you, and it will be arranged in your local area. There are many different types of accidents that can occur at a fairground. Not all accidents happen because of issues with the rides. Some accidents occur for other reasons, and slips, trips, and falls go into this category. Perhaps you fell due to a pothole that wasn’t corned off? Maybe you slipped on an unmarked wet floor? No matter what has happened, so long as you can prove that you were not to blame for the slip, trip, or fall you experienced, we will be able to secure compensation for you. Aside from establishing responsibility, the only other criteria you need to meet are as follows: the accident must have happened within the past three years, and you must have seen a doctor for your injuries. We can, however, arrange a local medical for you if required. All you need to do is give us a call. General damages – This is designed to cover the pain and suffering you have experienced. The payout amount is determined by the medical report your doctor has compiled. Essentially, if you have experienced any type of expense as a direct consequence of the accident, be it childcare costs or the cost of counselling, you will be able to make a claim for it. However, please note that you will need proof, so keep a hold of receipts and any other important documents. If you have been injured at any of the fairgrounds mentioned above, please do not hesitate to give us a call and we will be happy to launch a claim for you. A lot of people worry about making claims against large companies, as they fear the company will be able to use their size and power to wiggle their way out of it. Such fears are unfounded. It does not matter what fairground you were injured at, if the accident was not your fault, you have grounds to make a claim. If you want to make a claim for a fairground ride accident, you will need to gather as much evidence as possible to support your claim. Don’t worry if you cannot gather everything mentioned in the list below, but it is important to try to. The more evidence you can gather, the better. So, what type of evidence should you be considering? Medical report – A medical report that has been provided by your doctor will be the most crucial piece of evidence. This will be used to determine how much compensation you receive. This highlights why it is so important to see a medical professional after your accident, no matter how minor it may appear. Make a note of what happened – As soon as you get the opportunity, you should make a note of what happened. This will make sure you do not forget anything important later down the line. Witness contact details – If anyone witnessed the accident, it is a good idea to get their contact information. Witness statements can really help to strengthen fairground accident claims, as they help to prove your version of events. Photographs – If your injuries are visible, it is a good idea to take photographs. You should also take photographs of the damaged ride, if you are in a position to do so. Proof of expenses – You will be able to make a claim for any out of pocket expenses you have encountered due to the accident. In order to receive this type of fairground accident payout, you will need to have proof, such as receipts. Common out of pocket expenses include loss of income, counselling costs, travel expenses, and the cost of childcare. Loss of anticipated earnings £10,000 - £400,000 This is based on your future earning prospects, as well as your current grade of pay. There is potential for a higher payout based on your future earning potential. Loss of benefits £5,000 - £500,000 This is calculated based on the income you have lost. There is the potential for a higher payout in some cases. Pain and suffering £1,000 - £200,000 The level of pain and suffering experienced determines the compensation awarded. Mental anguish £3,550 Expectation of end of life, and fear of death. Head or minor brain injury £1,675 - £9,700 In such cases, any brain damage will be minimal. The level of award will be impacted by the absence or presence of headaches, the extent of continuing symptoms, the period taken to recover from any symptoms, and the severity of the initial injury. Post-traumatic stress disorder – severe £45,500 - £76,500 Such cases involved permanent effects, which will stop the person from functioning or working in the way they did prior to the trauma they experienced. Post-traumatic stress disorder – moderately severe £17,600 - £45,500 The difference between this category and the one above is the fact that the prognosis will be much better. With professional help, there will be some recovery. Post-traumatic stress disorder – moderate £6,225 - £17,600 In such cases, the injured person will largely make a recovery and any continual effects will not be grossly disabling. Post-traumatic stress disorder – less severe £3,000 - £6,225 In such cases, the claimant will make a recovery within one to two years. If there are any symptoms over a prolonged period, they will only be minor. Chest injuries – severe £76,500 - £114,100 This relates to cases where there is serious heart damage and/or the complete removal of one lung. There will also be permanent significant scarring and prolonged pain. Chest injuries – traumatic injury £50,000 - £76,500 This involves a traumatic injury to the heart, lung(s) and/or chest, which causes reduction of life expectancy, physical disability, impairment of function, and permanent damage. Chest injuries – moderately severe £23,800 - £41,675 Damage to the lung(s) and chest that causes some continual disability. Chest injuries – moderate £9,575 - £13,650 This relates to relatively simple injuries that will cause some lasting damage to the tissue, however, there will not be any significant long-term effects on the lung function. An example of this could be a single penetrating wound. Chest injuries – collapsed lungs £1,675 - £4,050 This relates to injuries involved a collapsed lung whereby an uncomplicated and full recovery is made. Chest injuries – fractures Up to £3,000 Soft tissue injuries or fractures of ribs that causes serious disability and pain, but only over the period of a few weeks. Back injuries – severe £29,475 - £122,350 At the lower end of the scale, there are cases of disc fractures, disc lesions, and soft tissue injuries. Higher awards are for cases that involve severe injuries, such as those involving damage to the nerve roots and spinal cord, which leads to a combination of very serious consequences. There will be severe disability and pain, with a combination of significantly impaired sexual, bowel, and bladder function, as well as incomplete paralysis. Back injuries – moderate £9,500 - £29,475 This is cases where there is residual disability but it is of a lesser severity when compared with the category above. At the lower bracket of this injury, there are claims involving disturbance of the muscles and ligaments, which results in soft tissue injuries and backaches. Back injuries – minor A few hundred pounds - £9,550 At the lower end of the bracket, the payout is for injuries whereby a full recovery has been made within a few months. At the higher end of the category, this is where a full recovery is made without surgery within about two to five years. The level of award is dictated by the need to take medication, the extent of any treatment required, the impact on the injuries on the person’s ability to work, the impact of the symptoms on the person’s ability to function, the presence of additional symptoms, the degree of pain experienced, and the severity of the original injury. Scarring to other parts of the body – burns - severe Likely to exceed £79,700 This refers to causes whereby there is a great degree of pain and the person suffers lasting psychological and physical injuries. The award is calculated based on the psychological impact, any resulting physical disability, the need for and extent of surgery, the cosmetic impact of the injuries and the person’s reaction to the them, whether the burns are superficial, partial thickness, full thickness, and the percentage of the body area that has been affected by the burn. Scarring to other parts of the body – burns - severe £5,950 - £17,275 This payout is for cases where there is a single disfiguring scar or there are a number of noticeable laceration scars. Scarring to other parts of the body – burns – minor £1,800 - £5,950 This is for cases involving a number of superficial scars or a single noticeable scar, with some minor cosmetic deficit. If you cannot find the injury you have sustained in the table above, don’t worry. All you need to do is give us a call and we will be more than happy to advise you further. One of the key benefits associated with choosing our service is the fact that all of our fairground injury solicitors work on a No Win No Fee basis. This means anyone is able to make a claim, irrespective of their current financial standing. No Win No Fee basically means that you only need to pay legal fees if your case is successful. Therefore, if for some reason we are unable to secure compensation for you, you won’t need to pay us a penny. This eliminates the financial risk that is associated with using the services of fairground injury lawyers that charge per hour. If you were to work with a solicitor that charges per hour, there is always the risk that you are going to end up with a massive legal bill and no compensation to fund it. Not only this, but you cannot be sure that the solicitor is taking on your case for the right reasons. After all, they are going to get the same amount of pay irrespective of the outcome of your fairground accident claim. When you work with us, you can be confident that we will never waste your time. We only take on cases that we believe have a genuine chance of success. There are many law firms in the UK that will be willing to take on your case, but we can promise you that you won’t find a better service than the one that we provide. We have many years of experience in the industry, and we have helped many personal injury victims to get the fairground accident compensation they deserve. Our reputation backs this up, and you only need to look at what our customers have had to say to see that this is the case. One of the factors that make us different from the rest is the fact that we truly care. We put our customers first at all times. We know that you are going through an incredibly difficult period at the moment, and the last thing we want to do is add to your stress. Instead, we will do everything in our power to secure the maximum fairground injury compensation amounts while you focus on your recovery. We always aim to secure compensation in the quickest and smoothest manner, so that you don’t feel any added stress. However, if you need us, we will always be there to take your call. If you want to make a claim for a UK fairground ride accident that you have been involved in, all you need to do is give us a call. You can speak to a friendly and professional member of our team by dialling 0800 073 8804. We will be happy to answer any questions you may have. If you are ready, we will begin the claim process for you, connecting you to one of our experienced No Win No Fee solicitors who will give you the best chance of securing the maximum amount of compensation you deserve. Have you suffered from PTSD due to a fairground accident contact us to find out if you can claim compensation today and get free legal advice. This link is useful for anyone that is feeling anxious after the fairground accident they were involved in. It takes you to the NHS page for post-traumatic stress disorder (PTSD). You will find information on the symptoms, causes, and treatment. This link takes you to a list of amusement park incidents. It includes incidents at Disneyland Resorts, incidents at European amusement parks, incidents at independent amusement parks, and more. This link takes you to the Government’s Health and Safety Executive website, where you will find information on health and safety for fairgrounds. This includes information of fair organisers, ride controller employers, self-employed fairground ride operators, and members of the public. Theme Park Accident Claims – How Much Compensation Can I Claim? have you been involved in a theme park accident? contact us today for free legal advice and find out if you can make a no win no fee theme park accident claim.